RUSH: I saw another Trump tweet that amused me today, made me laugh, and this one features a brand-new Trump nickname. And this is… I think it’s… This is anatomy of how Trump uses humor to deliver a knockout punch, and I think this is evidence that Trump has been a longtime listener to EIB Network because, of course, that’s what we do here. We’ve been doing it from the get-go. Combining humor — irreverent humor — with the serious discussion of issues, maintaining credibility in both areas at the same time. “I guess he doesn’t realize the economy is the best it’s ever been with employment being at an all time high, and many companies pouring back into our country. Wake up Punchy!” New nickname for Robert De Niro. Trump’s a master at choosing sustainable nicknames. Come up with a nickname, one that lasts. 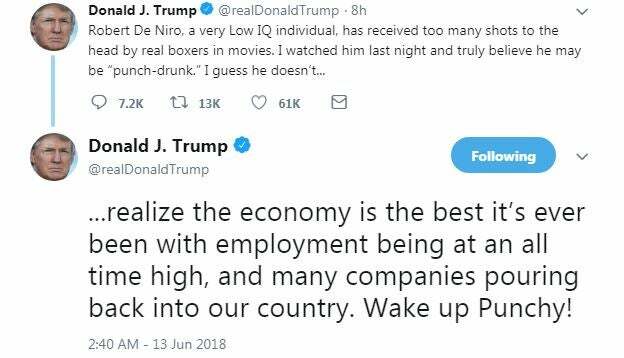 “Wake up, Punchy!” So Trump lets his audience know the origin story so that they’re in on it, because you know some Millennials may be unaware. 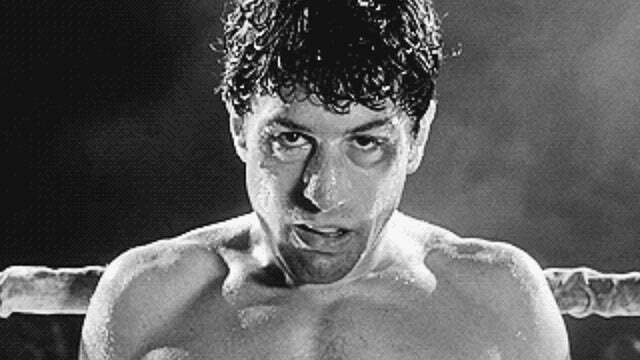 They don’t know that De Niro starred in Raging Bull or whatever it was. Their experience might be Meet the Fockers, or whatever that movie is. It was released in 1980, after all. So Trump combines “very low IQ individual” with “Punchy” and another hilarious, masterful tweet is born and one that just is despised by people on the left. You’re not supposed to make fun of great American heroes and actors like Robert De Niro. Sorry. “Bobby” De Niro. You’re just not supposed to do it. That’s another thing the Drive-Bys are focused on today, and that is there are some primaries yesterday. And Trump candidates won big. Anti-Trump candidates did not win or win big. And there’s a story here at Vox, which is a Millennial-targeted website. “Trump’s Biggest Republican Critics Paid the Price in Their Primaries on Tuesday.” Subheadline: “There’s a pattern to which Republicans are most likely to lose in a primary.” It’s written by Kay Steiger. See, I knew they have never gotten over that. They haven’t. To this day, they haven’t, because I’ll tell you why. That exposure would have killed any candidate. It would have destroyed the career of any candidate. You know it and I know it. Take your pick of any candidate and say NBC has video of them running around with Billy Bush bragging about all the wonderful things celebrities can do with and to women. It’d be the end of ’em. Trump not only survived it, it didn’t hurt him. He ended up being elected president. It’s one of the many things that they can’t reconcile. It’s one of the many things that they can’t get over. And rather than try and find out why, they just continue to sit there and get angrier and angrier and more and more poisoned, and they’re in this downward spiral of irrationality, and it’s becoming more and more obvious that they can’t recover from this. And Ms. Steiger writes here, “But fast-forward to 2018 and it’s not Trump who is paying the price for his comments. It’s the women who spoke up. Comstock faced a serious primary on Tuesday from Shak Hill, who tried to paint her as a Never-Trumper, and won with a less-than-inspiring 60% of the vote.’ What do you mean, less than inspiring? This is 60% of the vote in a primary! You only need 51. 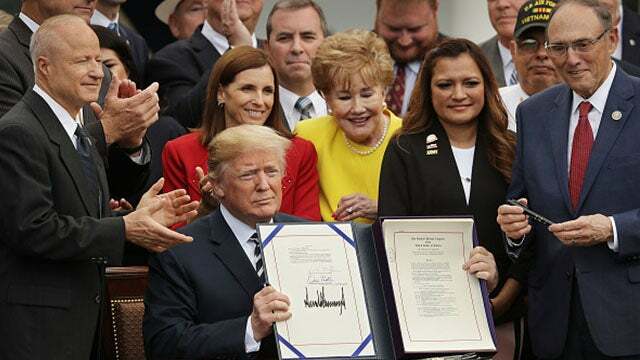 “Two weeks ago, Roby failed to secure enough votes to win renomination outright in Alabama and will battle the Trump-aligned Bobby Bright in a July runoff election. “Both Congress members voted with Trump’s agenda 97% of the time.” Subhead: “Trump critics are on the ropes around the country. Rep. Mark Sanford, who once gave an interview to Politico titled … ‘I’m a Dead Man Walking’ looked like he was going to lose his South Carolina primary on Tuesday, racking up yet another loss for those critical of Trump. Rep. Katie Arrington won the nomination with 51% of the vote, handing Sanford an embarrassing loss. “Though Arrington nominally ran against Sanford by calling him a ‘Washington insider’ who is responsible for ‘obstructionism’ — coupled with a sprinkling of references to his ‘Appalachian Trail’ scandal…” We all remember what that was. You remember what that was? Brian, you…? (interruption) Oh, you don’t know about this? He was governor of South Carolina, and he went missing. He went missing. Nobody knew where he was, and they were very, very worried. And then he surfaced. He said he’d been hiking the Appalachian Trail and got lost or some such thing. In fact, he was down in Argentina having an affair with a woman he was entirely smitten with. He had totally lost control. In fact as an aside, that proved to many, “If you ever find yourself in lust, you had better run for cover, because it’s the one emotion that will make you do the stupidest things you have ever done and you have no control over it. Lust, not love. Love is a great thing. Lust, folks, will make you do things you would never do. It will make you say things you would otherwise never say. And that’s what happened to Sanford. Although I think it became love. I think he’s still with the woman, if I’m not mistaken. I don’t know about that, but, anyway, the long-suffering, devoted political wife said, “Sayonara,” and he went away, and he paid his price, and he came back, and he has been a Never Trump and an anti-Trumper since Trump came on the scene. The bottom line with all of this is if the media has it all figured out, there’s this big blue wave and the Democrats are gonna win big because Trump is hated and reviled and everybody that voted for Trump can’t wait to correct their mistake — that they feel bad, they feel embarrassed that they voted for this… This is the narrative that the media has. And yet in every one of these elections — when these primaries come out, when they happen — if there is an obvious Trumpist running, the odds are on the Republican side that person’s gonna win, and the Never Trumper is gonna lose. And the media is beside itself once again over this ’cause it goes against the made-up, fictional narrative they have constructed, which is Trump voters are embarrassed and wish they hadn’t voted for Trump and can’t wait to correct their mistake by voting against him or his surrogates, i.e., in these primaries. And it just, of course, isn’t the case. And these people have not taken one step toward understandings Trump supporters, the bond they have. They have not tried to understand it, which, to me is malpractice. If you’re political consultant, you’d have to first and foremost have to understand that if you’re gonna bust it up. But I guess it’s so beneath them to even go out to where Trump voters are and actually trying to talk to them seriously because everybody knows Trump voters are the biggest blazing idiots on earth, and would be pointless to try to make them explain anything that you could understand. And so they don’t try. So head to the audio sound bites, as it’s an appropriate time for this. 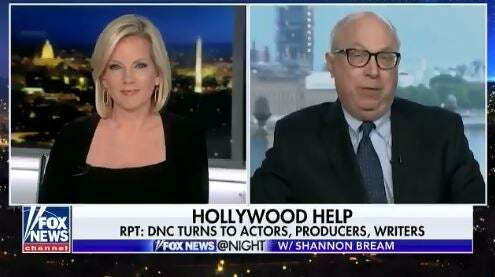 Last night on the Fox News Channel, Fox News @ Night with Shannon Bream. She had a section with Doug Schoen, and she wanted to play a clip of me from yesterday’s program for Schoen to react to, and this is it. BREAM: Rush Limbaugh talked about this today. I want play a little bit of what he had to say about this idea. RUSH ARCHIVE: Doesn’t Hollywood do this every year? Didn’t Hollywood run some objective here to convince Electoral College voters to not vote the way they were supposed to? Don’t they already do ads for various Democrat candidates? RUSH: And Shannon Bream went on to say (summarized) that Rush says that the George Clooneys of the world donate and star in commercials for Democrat candidates. Doug, this isn’t a new concept is it? Rush is, of course, right? SCHOEN: Right. But it’s unfortunately a failed concept. I would tell you as a Democrat who wants Democrats to take the House, they should 86 Hollywood. Go out and pursue centrist policies. Listen to people in the swing districts that voted for Obama and then voted for Trump in places like Pennsylvania, Ohio, Michigan, Minnesota. That’s how to win elections, not going to Hollywood. And I can tell you, by taking Trump and demonizing him, that’s a recipe for disaster. RUSH: See, they’re not gonna believe that. They think… Democrats think there’s a new — well, not new. But it’s cyclically new. They believe… It’s called negative partisanship, and the Democrats believe that the way you win elections now is to trash. That’s all you have to do: Trash your opponent. You don’t have to build yourself up; you don’t have to define yourself. All you have to do is trash your opponent. You know why they think that? ‘Cause that’s what they think Trump did. They think Trump engaged in negative partisanship by trashing all of his opponents. Little Marco. Lyin’ Ted. They haven’t the slightest idea why Trump won, but they think they know, and so their belief is that to beat Trump they’ve gotta come up with somebody who’s gonna trash Trump better than Trump is gonna trash them. Meanwhile, poor Doug here is asking these people, essentially, get rid of the radicals in that party and move back to the center and be the kind of Democrats like I am and we used to be. But that isn’t gonna happen because the money in the Democrat is all in the pockets of the really deranged, radical, angry leftists like Tom Steyer and George Soros, who are demonstrating that their money’s not buying anything anymore. I mean, there’s a major, major upheaval going on in the political science, not just the Democrats, everything. But primarily the Democrats, ’cause they don’t know, they don’t understand it, they can’t figure it out, they’re miscalculating it. And it’s largely gonna be fun to watch.